Footage has emerged of the Queen appearing to express mild irritation at Italian Prime Minister Silvio Berlusconi for being too noisy. The incident took place as the Queen posed with world leaders from the G20 summit in the traditional "family" photograph at Buckingham Palace. Mr Berlusconi then shouted "Mr Obama", prompting Her Majesty to turn around in mock frustration at the noise. Buckingham Palace have denied that any offence was taken by the Queen. The footage has been placed on the YouTube website and has quickly proved to be a popular clip. A palace spokeswoman said the atmosphere at the reception, during which the photograph was taken, had been "warm and friendly". "It was loud and jolly and very jovial, there were no gaffes and no offence taken," she said. 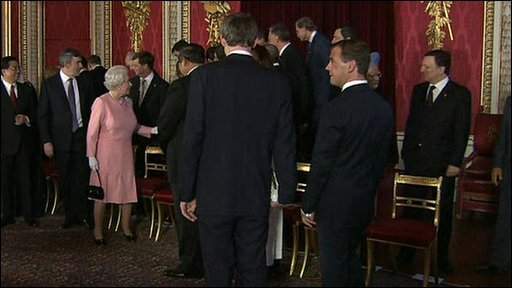 The Queen and Mr Berlusconi had earlier chatted as the world leaders gathered in the palace's picture gallery. Mr Berlusconi has developed a reputation for his outspoken comments and playful behaviour, even on the world stage. Last year he was filmed apparently playing "hide and seek" with German Chancellor Angela Merkel, hiding behind a large column as she walked past. And he was also criticised for describing Barack Obama as "young, handsome and tanned". The Italian leader accused his critics of being humourless "imbeciles". Meanwhile, Mr Berlusconi has confirmed that the G20 will hold a third summit on the financial crisis later this year in Japan, to follow up world leaders' meetings in London this week and in Washington in November.